Today is Good Friday. We celebrate the sacrifice that Jesus made for us on the cross. 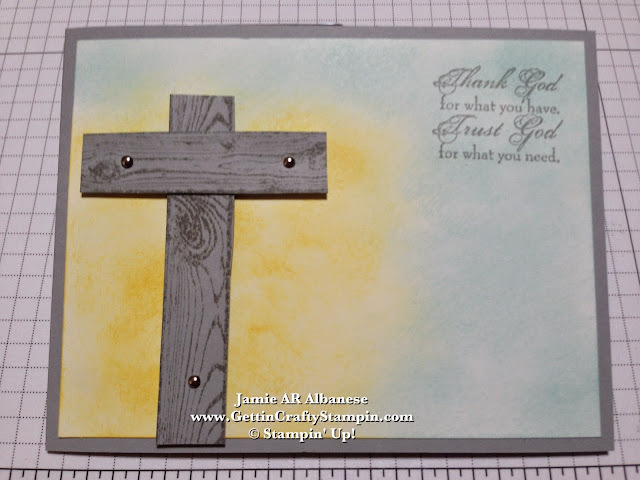 In honor of this day and momentous event, I created this easy Hardwood Cross hand-stamped card. Celebrating events in life, like this, is an honor and a blessing. Join me in creating this card and celebrating life! 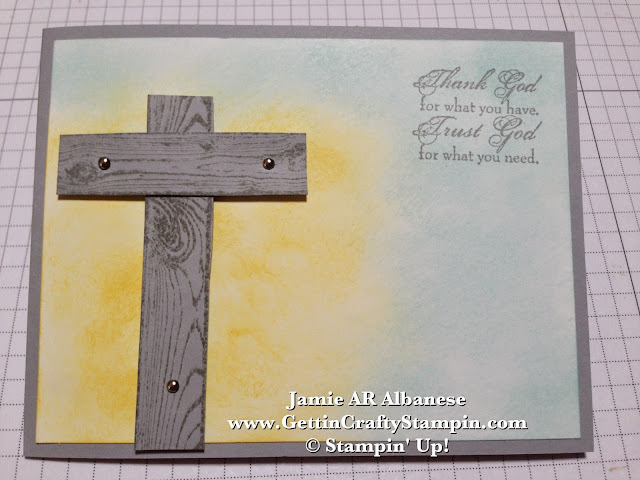 Stamping this Hardwood background stamp with Smoky Slate ink on Smoky Slate card stock gives a vintage feel. Cut two strips out of this stamped image and lay them out. Adding the Mini Brads to this signifies the sacrifice while honoring His resurrection. Pairing this Smoky Slate with the Daffodil Delight and the Soft Sky is with the help of my Color Coach (YAY - one of my favorite tools #130118). 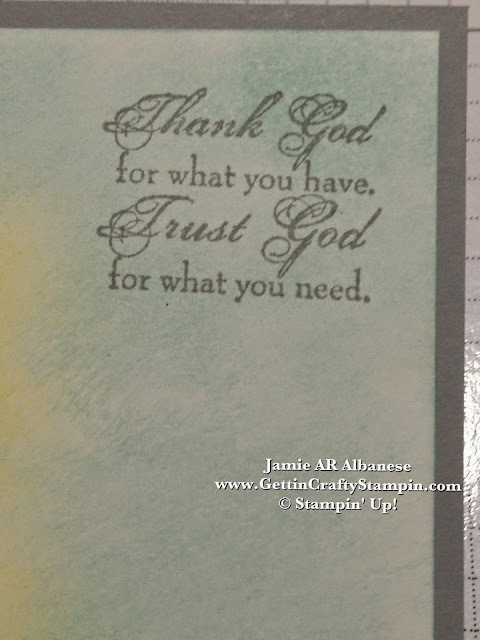 Using the Daffodil Delight ink and Stampin' Sponge I rubbed a highlight to this Whisper White card stock. Adding the Soft Sky ink the same way to the outside of the Daffodil Delight for a sunrise feel. The Trust God stamp set is a must! I use this set for so much!! Here the Trust God sentiment is ideal, especially for me, when I struggle in times of trial. Stamping this with Smoky Slate for a color coordinated look. May you find time to celebrate life. 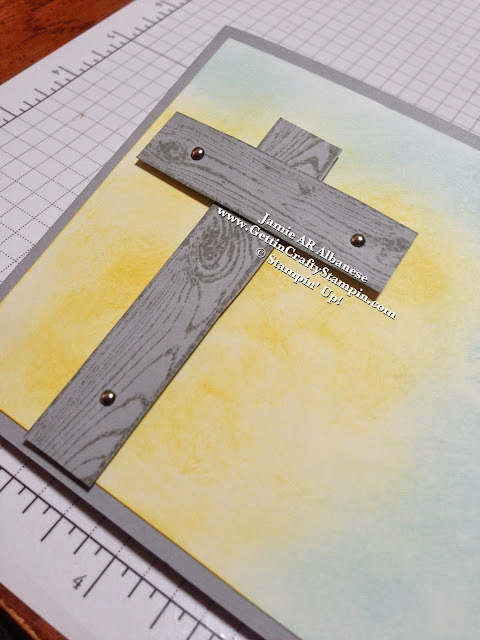 This Hardwood Cross hand-stamped card is perfect for our pastor or my mother-in-law. Creating this quick and easy card is perfect in my busy life. May you be blessed by this Good Friday, what the Lord has done for you (as well as me and mine). Happy (almost) Easter! !